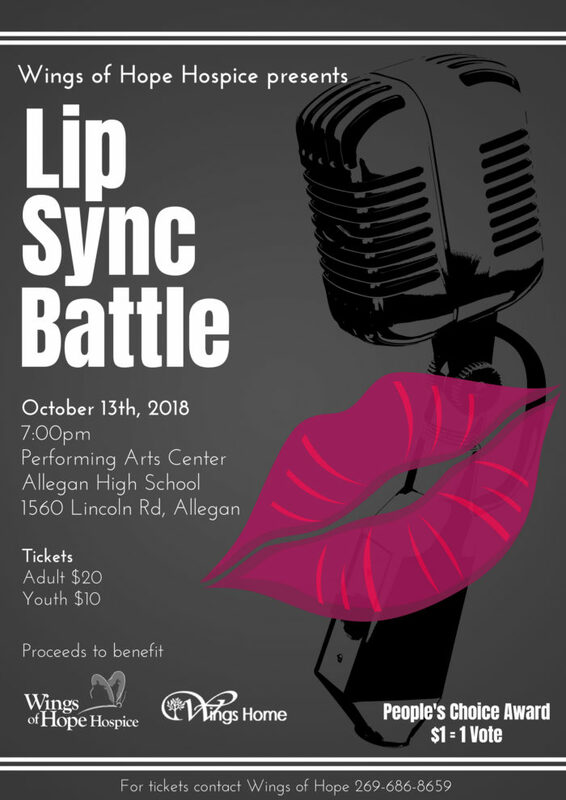 Loosely based on the popular TV show, groups in the community will be preparing their best lip sync routine and competing for the coveted People’s Choice Award. This award is a monetary vote by attendees/supporters. Every dollar equals a vote for your favorite performers and will take place at intermission. Proceeds to benefit Wings of Hope and Wings Home. Join us on October 13th for an evening filled with fun and entertainment and help raise money for two important organizations. A BIG Thank You to Allegan General Hospital for supporting this year and being our Event Sponsor. Tickets are $20 for adults and $10 for youth. They can be purchased at Wings of Hope Hospice, www.wingsofhopehospice.com/donate/, 269-686-8659 or visit us at 530 Linn Street in Allegan. Hope you can make it! You can also visit our donate page to vote for your favorite group. Simply put the group’s name in the remarks/special instructions, www.wingsofhopehospice.com/donate/.